The eating out options in Delhi are more than ever now. To up the level (and to beat competition) restaurants are offering unique dining experiences. While you can try the self explanatory “dining in the dark” at a few eateries, another offers the concept of “eat your words” – where the dishes of an evening are inspired by popular books or poems. 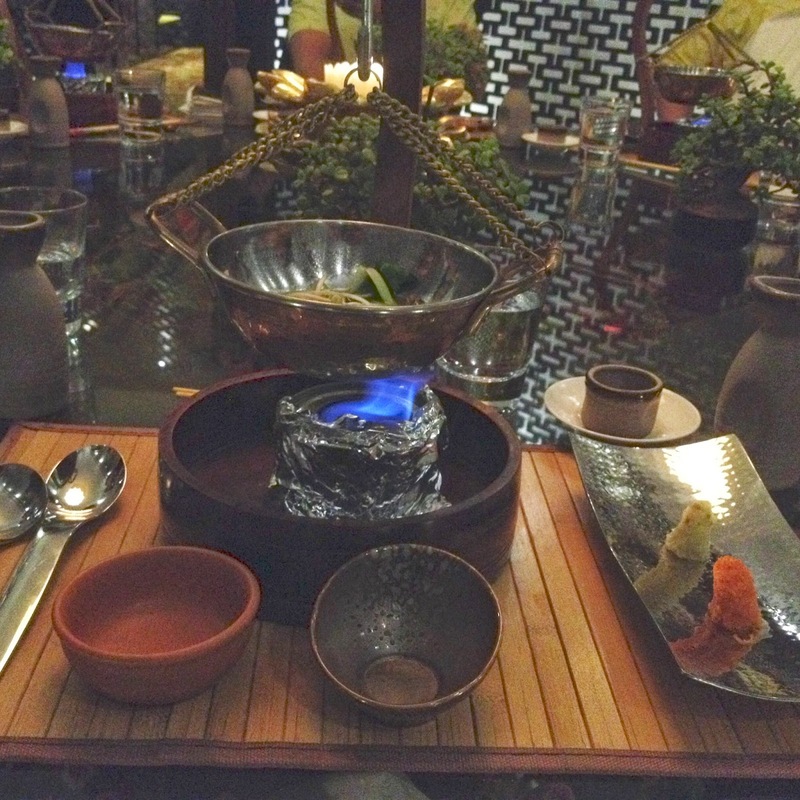 But the soon to be introduced Korean Temple Cuisine at ITC Maurya’s rooftop restaurant, Tian - Asian Cuisine Studio, is a first for Delhi. Unlike my other posts, I’ll have to refrain from getting into the details of this meal. Firstly, I don’t want to give away surprises that Chef Vikramjit Roy is famous for. And secondly, this meal is an experience that I would urge you to try for yourself, because it goes beyond the food. Other than being informed that it’s an entirely vegetarian Korean meal, I have no clue what I am in for when I reach for the preview. We are served champagne before being escorted to the dining area. We are asked to remove our shoes, dip our feet in a tub of water and enter the dimly lit room. In typical Tian style, we are given step-by-step instructions to enhance the whole experience. To start the dramatic gastronomic journey we stand behind our chairs while the servers place some individual dishes for guests. Something is poured at the base of the dish that creates wafts of aromatic smoke. Then the lights are slowly increased and we are requested to take our seats. We then take three deep breaths and start the first course of the evening – dehydrated fruits. It's incredible how the flavours of each fruit – there are five thin slices of different fruits – is enhanced dramatically. Now the mystery veil surrounding the meal is slowly being lifted. After spending a fair amount of time in Seoul, Chef Vikram is ready to offer his take on the Korean Temple Cuisine. “This meal is made without any onion or garlic,” he says. Really?! Garlic is one of the key ingredients of Korean food, I thought. He adds that he would like us to avoid having alcohol during this meal not for any religious purpose but because he would prefer us to focus on the food. We are surprised when he tells us that there has been no added salt in the entire meal; pickled vegetables and other ingredients that have natural/inherent salt have been used to lend the savoury flavour. “Chefs are generally used to just throwing in salt or garlic to make the food tasty but this meal has been cooked with utmost honesty and integrity,” he explains. Then course after course (we are served 11 courses!) we are amazed with different textures and flavours, surprises on the plate and the palate, each course building up to the next. Without going into much detail I’ll let you in to a few courses. We are served a congee of black sesame with Korean brown rice and kimchee three ways. While one course features seven different textured vegetables with gochujang (fermented Korean chilli) and soymilk mousse the next comes with seven vegetables again, but served with edamame and Korean cheese mash. While this meal is absolutely fantastic for vegetarians, I can assure you that despite loving our meats none of us missed them the entire evening. 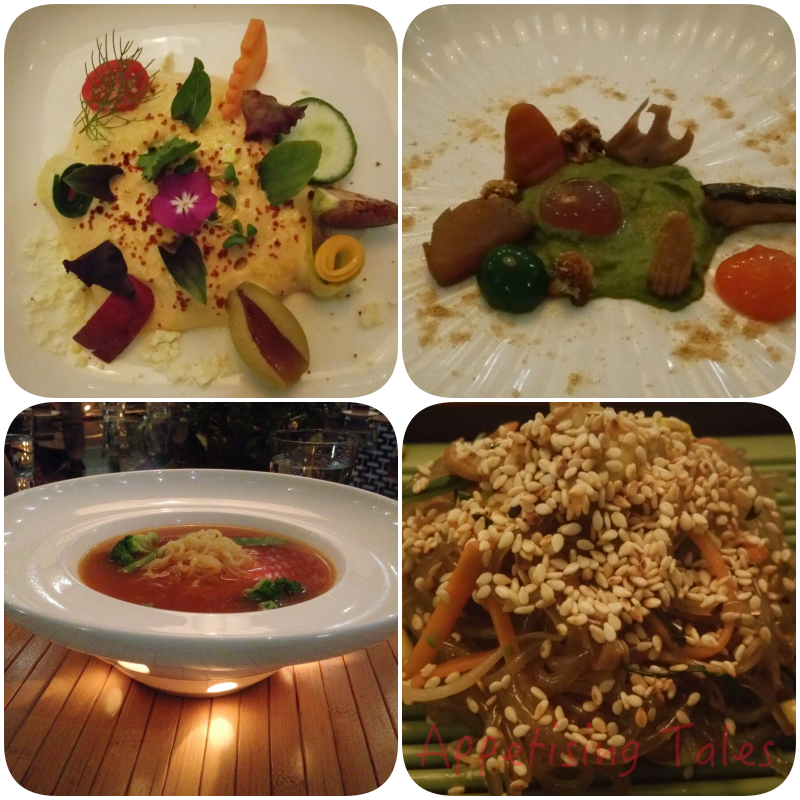 Luscious broths, fantastically textured vegetables, japchae noodles and a bit of molecular gastronomy - I promise you'll be in food heaven. We could give it all sorts of names like soul food and such, but I will simply leave you with an image of some of the dishes that we enjoyed. For the rest, just head to Tian to experience it for yourself!